Dolphin 24x7 is one division of Velan Info Services (India) Private Limited. We take care of IT infrastructure Management division. Velan Info Services is an established IT and ITES outsourcing and offshoring service provider. Our clients are from Europe, North America, and Australia. We have an infallible record of delivering services to our clients. You can concentrate on your business and enjoy an increase in revenue, market growth, and competitive advantage by letting us take care of your needs. We take pride in calling us a pioneer in Infrastructure Management Services (IMS). We have assisted many Fortune 500 companies and enterprise clients to grow their business with our support and workable technical solutions. We have reduced the Total Cost of Operations (TCO) of customers. We achieve this by implementing some efficient and sophisticated technologies. We take a little time to fathom the requirements of our customers regularly to be innovative, so they can cope the pace of emerging trends and technologies. 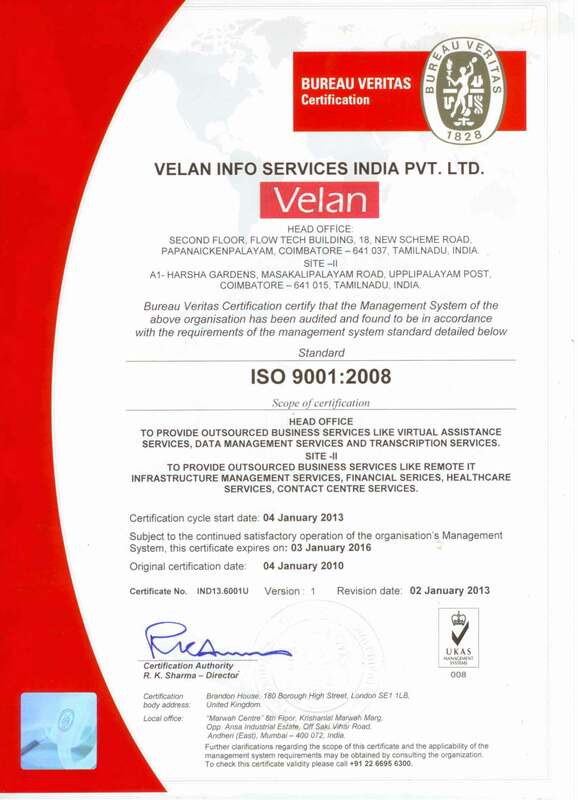 Velan Info Services has a team of highly skilled engineers, who report a consistent growth rate since the launch. Our team endeavors to acquire 100% customer satisfaction. This will be achieved by rendering organized and effective support practices on different channels like Instant Messaging, Telephone, and Emails. We provide effective and faster support to our clients. This is achieved by performing your roles of in-house IT support team at affordable costs. The company takes pride in the support features presented to our customers in providing fast and effective support by enacting the role of your in house IT Support Team, remotely, at a reasonable cost.